Every weekend, Saucer and I would venture to our neighbourhood area to look for new places to dine. Last weekend, we were driving past the Kuchai Lama area and noticed this restaurant called Star Village that seemed to be packed with people. Since we were feeling a little adventurous, we decided to park our car and give it a try. It was 8pm on a Saturday night and the place was full! We had to wait for about 5 minutes to get our table but other than that, service was prompt. 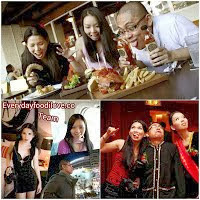 Latest food reviewed of Star Village 18th Aug 2011 by EverydayFoodiLove.com...check it out too! My niece Heidi ordered the Black Pepper Chicken which was one of the recommended dishes in the menu. The size of the chicken chop was huge, using a whole chicken thigh that was well-marinated and tender. The sauce was savoury and peppery but not overpoweringly so. I think she enjoyed her chicken very much that night for the 8-year-old managed to finish the whole thing on her own! The dinner experience at Star Village made us understand why this was such a favourite among the locals. The service was prompt, the ambience was cozy, the food was reasonably good and price was affordable. It’s definitely a place that we would go to for that Western food fix without having to burn a hole in our pocket!